Gnome Summoner, Skotty Nar. Two descriptions either will work (character is a synthetist that fights inside his summoned creature). 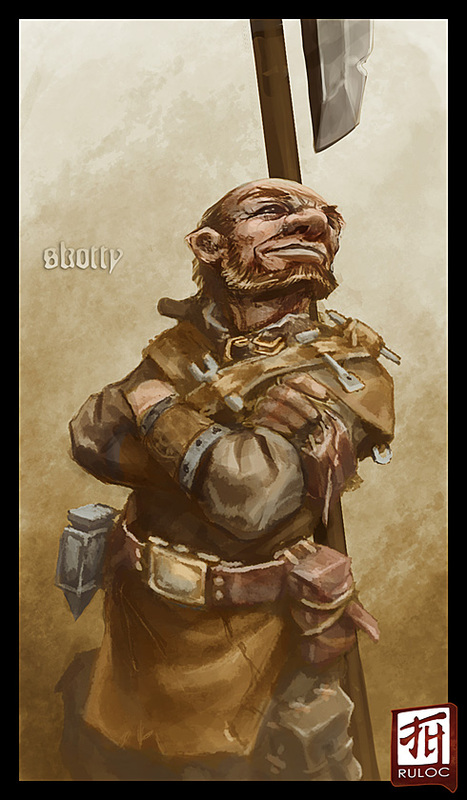 Out of eidolon: Skotty is a small framed Gnome, with short brown hair (balding with a receding hairline) and an 'Amish' style mustache-less beard. A weapon crafter by trade, he is dressed in functional engineer-style garb, with a bandoleer of tools, as he often crafts weapons or clockwork toys (using mage hand to have is tools float around as needed.) He is never far from his comically oversized pole-axe.